Another week has passed, and with that comes yet another FIFA 19 Ultimate Team Team of the Week! Every week EA Sports pick the top performers in the world of football and rewards them with an improved limited edition card that reflects their real-life performances. There are always some very eye-catching cards amongst the group, and this week is no different. Here is the FIFA 19 FUT Team of the Week 5. With most leagues around the world on a hiatus this week due to an international break, this batch of players have been recognised for their form with their nations. Virgil van Dijk has been rewarded for his goal scoring exploits for The Netherlands, while Romelu Lukaku's card looks almost unstoppable. Take a look. The Premier League is always the most popular league in Ultimate Team, so FIFA 19 fans will be pleased to see a number of representatives from the English top flight in this week's team. Van Dijk's upgrade will make him even more difficult to get by in the final third, while Lukaku's mixture of pace, power and finishing is sure to be a nightmare for opposing defenders. Arnautović's very balanced card makes him a very appealing option, and he could also be deployed in a deeper role. James Rodriguez has been recognised for his incredible strike against the USA, with his card also featuring a position change. Now a RM, he will be very effective cutting in from the flank onto his deadly left foot. Alex Sandro is one of the most popular left-backs in this year's game, so his in-form card is sure to fetch a high price on the transfer market. 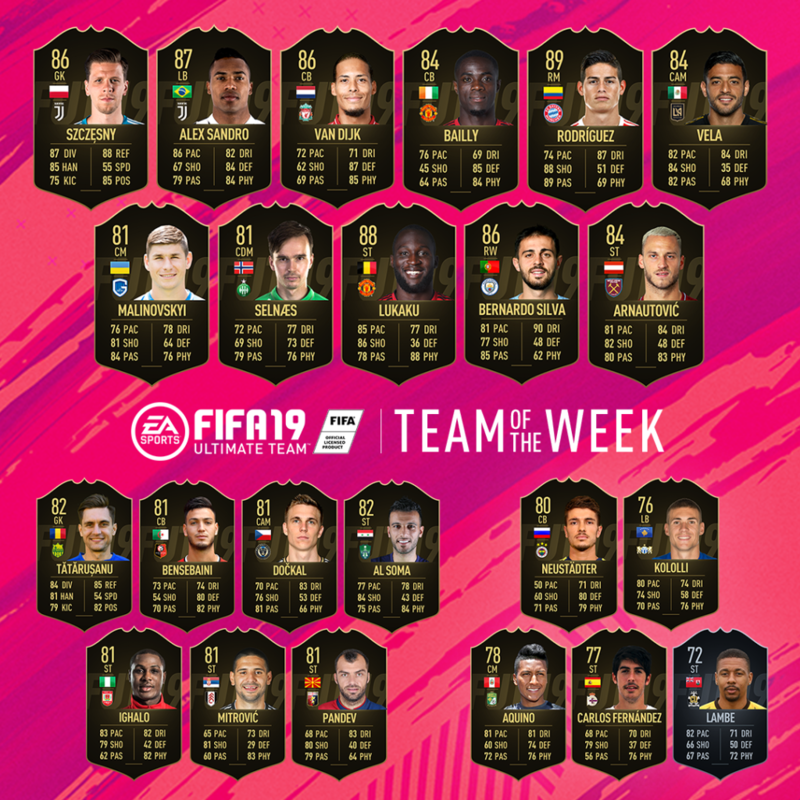 EA Sports will release a new batch of TOTW cards every week for the entire season, so we are sure to see some unbelievable players over the next few months. Make sure to keep an eye out so you can improve your Ultimate Team.